The engineer who operated Amtrak 188 was qualified and competent, but remembers nothing from the fatal crash, investigators said after interviewing him. The NTSB is now asking FBI help to look into allegations the train was struck or shot at. Speaking to reporters at the last Philadelphia-based briefing, Robert Sumwalt of the National Transportation Safety Board said his investigators have interviewed the engineer and two other crew members from the Amtrak 188 train, describing them as “traumatized” and not yet fully recovered from their injuries. One of the conductors testified she had heard an engineer aboard a local SEPTA train reporting “either being hit by a rock, or shot at,” and putting his train into an emergency stop with a broken windshield, Sumwalt said. The conductor believes she heard the Amtrak engineer reporting “something about his train being struck by something” as well. Reports of #Amtrak locomotive being struck will be subject to inspection and verification. The NTSB has not independently confirmed the information, but investigators have seen damage to the “left-hand lower portion” of the Amtrak train’s windshield. The Bureau has asked FBI crime scene teams to examine the Amtrak locomotive, which showed a “circular pattern emanating outward,” perhaps caused by an external object. Sumwalt told reporters that the train’s engineer, whom he did not name, felt “fully qualified and comfortable with his equipment, and reported no problems with his train handling.” The media have identified the man as Brandon Bostian of New York. The investigation will proceed to reassemble the wreckage and examine the braking mechanism, compare the damage to the cars to computer models, and await the results of medical tests administered to the engineer, as well as the FBI examination of the windshield. Sumwalt declined to offer any preliminary conclusions or speculation as to what might have caused the derailment of Amtrak 188 on Tuesday evening. “Amtrak takes full responsibility and deeply apologizes for our role in this tragic event,” Boardman wrote. Eight passengers died in the crash and more than 40 remain hospitalized. 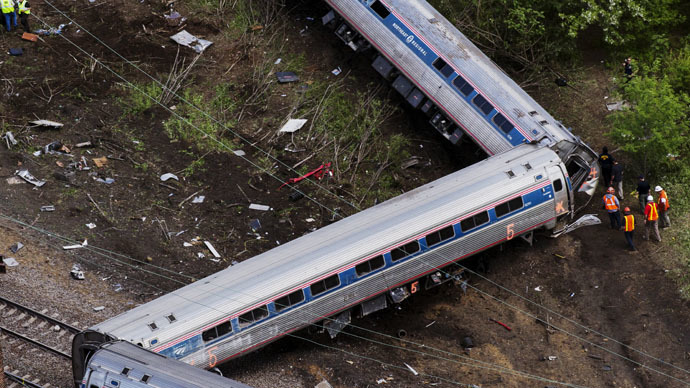 There were 243 people on board, including five Amtrak crew workers. Security camera footage showed the train entering a sharp turn at over 100 mph in a 50 mph zone. NTSB investigators say the train operator had applied emergency brakes and reduced the speed from 107 mph to 102 before the train jumped the track. Amtrak continues to run trains north of New York City and between Washington, DC and Philadelphia, but the Philadelphia-to-New York route remains suspended. The railroad’s Northeast Corridor, between Washington, DC and Boston, carries 12 million passengers a year.